movement to help spread science-based skepticism around the country and the world. aggressive campaign to help create local and regional skeptic groups in the United States (as well as in other countries). number of first-class scientists and engineers. 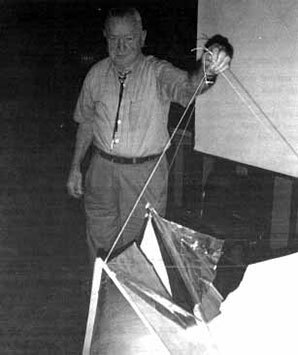 It also was the locus of a lot of New Age and pseudoscientific hooey. John responded in friendly fashion but said “my decision is not to start a group now.” He gave a number of reasons, but ended, “I’m going to bide my time. Two years elapsed before that fledgling effort came to fruition. south through the Albuquerque area and to Santa Fe and Los Alamos in the north got it. CSICOP could send information packages. actively involved. Some of the people who returned surveys are still active today, such as M.B. (Mark) Boslough, Gerald Shelton, Ted Cloak, and Rick Buss. Hotel and a self-described “physics groupie”; and writer/historian John Pen La Farge. rental fee. I still have that receipt and rental agreement. Do We Want a Local Group? What Are the Major Local Issues? 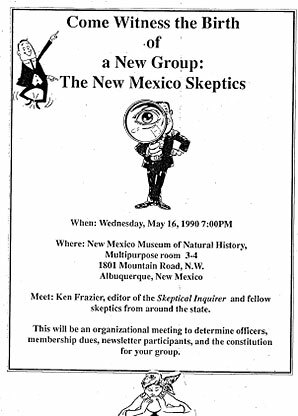 I began by telling them that New Mexico was tied for second among all the fifty states in Skeptical Inquirer subscribers per capita. They expressed enthusiastic support for a local group. They engaged in lively discussion of possible goals, programs, and policies. That was a big first step. The next big step in the meeting, and a giant relief for me, was when John Geohegan kindly agreed to serve as chairman. Whew! sample of a generic constitution and bylaws CSICOP had in its kit for local groups and a copy of one local group’s actual bylaws. debate my suggestion of New Mexicans for Science and Reason was voted on and approved. We have been known by that name ever since. I think it has served us well. 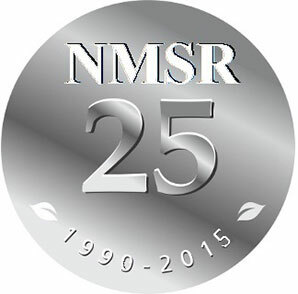 newsletter (The Enchanted Skeptic, succeeded a few years later by the monthly NMSR Reports, now it its twenty-first volume). We were off to the skeptical races. that post all these years. groups; it is run efficiently and economically; and it has been a consistent, strong presence. of pseudoscience for years and years to come.